FILE - President Donald Trump delivers his State of the Union address to a joint session of Congress on Capitol Hill in Washington, Jan. 30, 2018. A: No. For Thomas Jefferson's first address on Dec. 8, 1801, he sent written copies to both houses of Congress to be read by each chamber's clerks. Jefferson wanted to simplify what he believed was an aristocratic imitation of the British monarch's speech from the throne, which he thought ill-suited for a republic. The practice of sending written copies to Congress continued for more than a century, when Woodrow Wilson resumed the tradition of delivering the annual message in person on April 8, 1913. He's also credited with transforming the speech from a report on executive branch activity into a blueprint for the president's legislative agenda for the year. 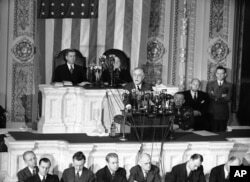 FILE - This Jan. 7, 1943, photo shows President Franklin D. Roosevelt giving what was then known as the president's annual message to Congress on Capitol Hill in Washington. ​Q: When did the annual message become known as the State of the Union address? A: Franklin D. Roosevelt applied the constitutional phrase "State of the Union'' to both the message and the event. It became the popular terminology from then on and has officially been known as the State of the Union address since 1947. The speech was formally known as the "Annual Message'' before that. A: Calvin Coolidge delivered the first speech broadcast on radio in 1923. Harry S. Truman's address in 1947 was the first broadcast on television. Lyndon B. Johnson recognized the importance of having a national audience when he moved the speech from midafternoon to prime time in 1965 to attract the largest number of TV viewers. George W. Bush's 2002 speech was the first available as a live webcast on the White House website. A: Yes, there have been several instances, though all appear to have been initiated by the White House, historians say. Ronald Reagan's 1986 address, for instance, was postponed after the Challenger space shuttle exploded in flight on Jan. 28 of that year. And in 1944, Franklin D. Roosevelt was scheduled to deliver his address on Jan. 11 but instead transmitted a written message because of his poor health. 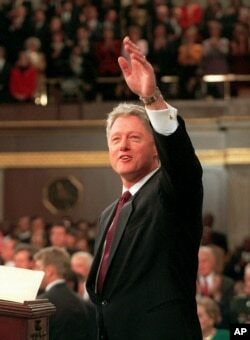 FILE - President Bill Clinton waves prior to giving his State of the Union address, Jan. 23, 1996 on Capitol Hill. Q: Can't Trump just show up? A: No. Anytime a president comes to speak, it must be at the request of Congress, said Donald Ritchie, the former historian of the Senate. "It's a very inflexible arrangement,'' he said. 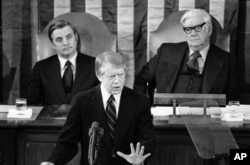 FILE - President Jimmy Carter delivers his State of the Union message to a joint session of Congress in Washington, Jan. 19, 1978. Carter sent his final message, in 1981, in print. ​A: No. Truman sent his final message in print, as did Dwight D. Eisenhower in 1961 and Jimmy Carter in 1981. As Eisenhower recovered from a heart attack in 1956, he prepared a seven-minute filmed summary of the message from his retreat in Key West, Fla., that was broadcast nationwide. Richard Nixon sent a printed message in 1973; his staff said an oral message would have come too soon after his second inaugural address. Q: Which presidents didn't deliver a State of the Union message? A: There's no reason why not. Trump could deliver a speech from the Oval Office or organize an alternative event on Jan. 29 — the date Pelosi had originally invited Trump to deliver his address before a joint session of Congress. The White House also could choose to delay the speech, as Pelosi has suggested. It was unclear how the White House planned to respond. But Ritchie said it would be to the president's advantage to find a way to deliver the address. "You don't want to waste a dramatic moment,'' he said.